I’ve talked about the value to self leadership of learning to say ‘No’, but equally important is learning when to say ‘Yes’! And finding that balance is really key to self leadership and consequently your own happiness. Often we’re waiting for something ‘big’ to happen in our lives. We want it – we long for it. But when it comes our way, do we even recognize what we need to do. Do we realize that all it takes from us might be a simple action, or a big ‘Yes’? Days passed. Then weeks and months. But nothing happened. Are we buying ourselves those lottery tickets for the big game of Life? 1. For the next week, spend a few minutes focussing on cultivating a greater openness to receive. 2. During this time say/write : ‘One way life is being good to me right now is……..’ Don’t edit your responses. Let them flow. 3. Once you have written down at least 7 -10 responses. 4. Say ‘Yes’ to all these experiences and for all the goodness to come. 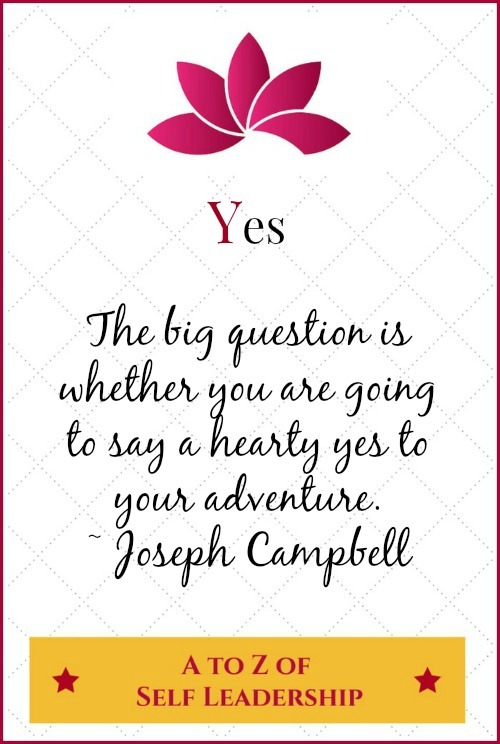 The big question is whether you are going to say a hearty yes to your adventure. Today I’m on ‘Y’ of the Blogging from A to Z April Challenge. My theme is the A to Z of Self Leadership. I’m also undertaking the NaBloPoMo for April – the theme is ‘grow’ and the Ultimate Blog Challenge. A lot of people waste a lifetime cultivating negative thoughts. The action steps you have mentioned here seems very interesting to me.